Situated on two private acres among pinion, juniper, and Ponderosa pines in the foothills of the Sangre de Cristo Range, this newly-built(2003), three bedroom plus house is a perfect spot to relax after a long day spent skiing or seeing the many sights of Taos. This is a hand-crafted, custom-built, Non-Smoking home with Southwest touches such as coved plaster ceilings, log vigas, and the traditional Northern New Mexico-style pitched roof. The house’s many windows are oriented to frame the mountain views and embrace the New Mexico sun with a warm southern exposure that heats and brightens the house all winter. The large south-facing deck on the main level and the two private upper balconies can be enjoyed all year. A full-length covered porch on the north side stays cool through the summer months and provides plenty of room to stomp off snow in the winter. The house is located north of the town of Taos (nine miles), off the road to the Taos Ski Valley (eight miles). The elevation is estimated to be 7900 feet - which means cool and refreshing nights even in the heat of the New Mexico summer. Inside, there are three bedrooms: the master bedroom downstairs and two bedrooms upstairs. One upstairs room has a lovely view of the Taos Ski Valley mountain, and is furnished with a queen bed. The other bedroom has twin beds and an optional futon double mattress for additional guests. Both upstairs rooms have large private balconies with southern views of the Truchas mountain range. The entire first floor has vigas with coved ceilings, and French doors opening onto the large south deck. The master bathroom has a large tub with a picture window framing a view of pine trees. The living room has a large fireplace, for nights before the roaring fire. The living room also has a queen-size sofa bed for extra sleeping capacity. The attractive kitchen has a Jenn-Air range and granite tile countertops, and is fully-equipped for most cooking needs. There is an outdoor Jacuzzi tub for skiers to soak away the effects of a long day on the slopes. Taos Ski Valley is near our house, and Angel Fire is a short drive in the other direction. In winter, snow often blankets our property and there is a sledding slope for kids near the driveway. In summer, you are encouraged to bring your mountain bikes to explore the trails reached directly from our house. NOTE: Our house is reached by a 1.9 mile county-maintained dirt road (Gallina Canyon Road). Depending on the time of year, a four-wheel drive vehicle may be recommended due to snow conditions. This is our family enjoying the house! The house was wonderful. The road up was a little rough. If I hadn't had a jeep it might have been difficult. But it is Taos in winter. We loved the house and the view. Coffee on the porch and dinner in after a day on the slopes was perfect. The property checked all the boxes. Plenty of space and beds for sleeping. Game room with ping pong and darts was a plus. It’s about 25 mins from Taos Ski Valley. Would recommend this house during any of the four seasons. Perfectly situated with all amenities and spectacular views. 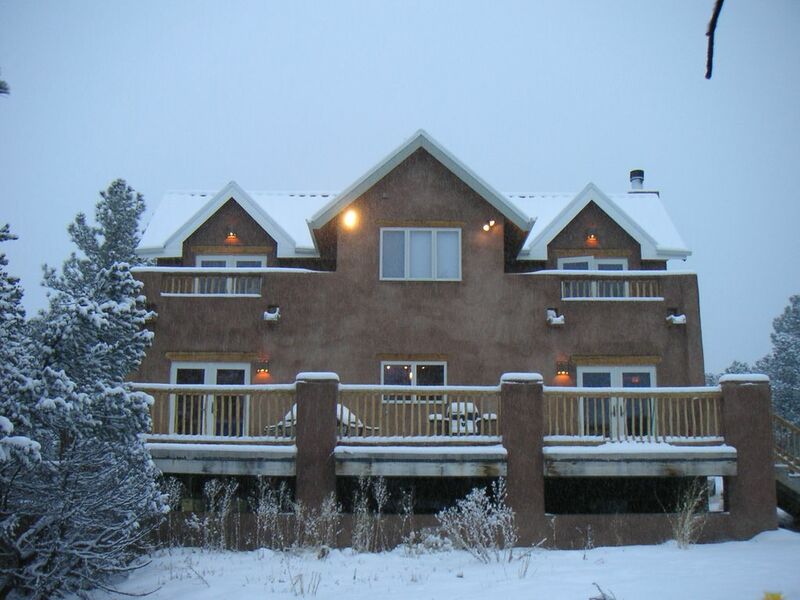 The house is large, comfortable, and set in the Taos foothills with easy access to the ski valley and town. Excellent restaurants nearby and hikes (easy to challenging) from the front door into the Carson National Forest. We had a great stay overall. The house had plenty of space, the hot tub worked well and the porch and upper rooms had a great view over the valley. The location was further from town than is shown with the location of the pin on the map. Beautiful. Amazing views! Very close to the Taos ski valley! We would stay here 100 times. Very spacious. Beautiful property. Easy to find. Deposit will be refunded if premises left in good condition. Pet fee is $50 and a pet deposit of $250 is refunded if no pet damage and no pet mess.